What are your options when a tour operator takes your money and gives you nothing in return — including a refund? Let’s have a look at the case of Ruthanne Kuss to find out. Almost two years ago, Kuss paid a tour operator over $10,000 for a trip that never took place. Since that time she’s heard one outrageous excuse after another about the cancellation and missing refund. But now she’s tired of waiting and wants the Elliott Advocacy team to help her get her money back. This case is one that highlights the importance of carefully vetting any tour operator before you plunk down your cash. The negative information about this particular company was readily available online. If only Kuss had taken a look. Unfortunately, she didn’t — until it was much too late. In January 2017, Kuss and her husband started planning a new adventure. They came across a tour operator called Uncommon Journeys. It seemed to have a unique array of travel options that appealed to the couple. The duo spoke to a vacation planner at Uncommon Journeys. When all was said and done they settled on a trip that included a riverboat cruise and a train adventure. Kuss paid the initial deposit of $3,127 with her Discover card. In July, Kuss received a reminder that it was time to pay the $7,533 balance of the trip. Again, she made the payment using her Discover card. Now the tour operator had over $10,000 of the couple’s money. And then came Hurricane Irma and Hurricane Maria. Soon after the monster storms, Kuss received a surprising and unlikely cancellation explanation from Uncommon Journeys. But no offer of a refund. Where is that $10,000 refund? For the next month, Kuss emailed and phoned the tour operator many times and asked for the refund. After the initial offer of the replacement vacation, Uncommon Journeys stopped responding. At that time, Kuss believed that the company had involved itself in an important humanitarian effort. That wasn’t true at all — but I’ll get to that in a bit. And Kuss assumed that mission in Puerto Rico was the reason for Uncommon Journeys’ lack of response. And while she empathized with the dire situation there, she didn’t want to leave her $10,000 in limbo. After one month of continued silence from Uncommon Journeys, she contacted Discover with her concern. Discover told Kuss that the time for a dispute had passed on the initial payment. If she wanted to get her money back from the tour operator, she would have to contact Uncommon Journeys directly. And then Kuss found herself in an endless struggle with Uncommon Journeys for her $3,127. Throughout the next year, Kuss periodically received emails from the company stating that it would soon process her refund. But it never did. In September 2018, Kuss admitted she could not fight the battle alone. She needed help. That’s when she contacted the Elliott Advocacy team. When Kuss’ complaint landed in our helpline, I tagged it as yet another complaint against this infamous tour operator. I say infamous because our advocacy team has been tracking cases against Uncommon Journeys and its sister company, French America Line, since early 2017. Regular readers of our site may remember my article about Cathy Elliott (no relation to Christopher) — Uncommon Journeys to a refund. In that case, Elliott (a travel agent) was having extreme difficulty securing a $2,500 refund for her client. Uncommon Journeys had taken her customer’s money and, after a cancellation, promised to return it. But months later the troubled tour operator still had her cash. In desperation, Elliott contacted our advocacy team for assistance. And although we do not typically mediate on behalf of travel agents, I decided to contact the owner of Uncommon Journeys for an explanation. At that time, Christopher Kyte, who owns both Uncommon Journeys and French America Line, had a variety of excuses for the lack of refund. And when another month went by and the refund didn’t materialize, I recommended that Elliott’s client file a credit card chargeback dispute. With all the facts on her side, she won the dispute and retrieved her money. Elliott herself wasn’t as lucky. It turns out she had planned her own Uncommon Journey but paid for it with a check. That was a huge mistake. When the tour operator canceled her trip as well, a credit card dispute wasn’t an option. Her $9,000 is still in limbo. But back to Kuss. In her case, I felt sure that Discover had made a mistake rejecting her chargeback request. The Fair Credit Billing Act was created to protect consumers who use credit cards to make purchases. In this situation, Kuss had paid Uncommon Journeys for services it had never provided. She qualified for a dispute of all of the funds paid to this tour operator, not just the final payment. But it was almost a year after Kuss had made her initial deposit when she asked to begin a chargeback dispute. According to Discover, that was the problem. From the text of the FCBA, we know that a consumer must initiate a chargeback within 60 days of the problematic charge. But that figure is not set in stone. 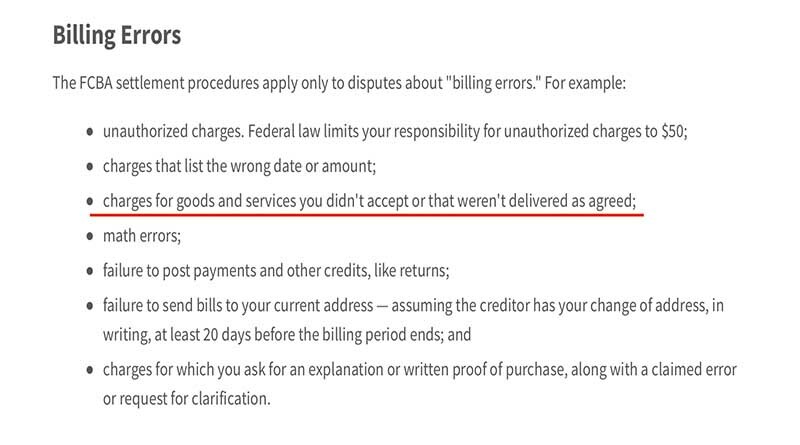 A credit card company can always protect its customer regardless of the date of the charge in question. And in a circumstance such as this one, where the charge did not become problematic until the company canceled the trip almost a year later, Discover should still be able to help its customer. In October 2017, when Airberlin suddenly ceased operations, our advocacy team received a plethora of pleas for help (See: Airberlin is out of business. How do I get a refund?). Those consumers had purchased airline tickets that were suddenly worthless. And under bankruptcy protection, Airberlin would not be issuing any refunds. To find out how to best help the legion of would-be passengers who were inundating our helpline, I contacted the Federal Trade Commission for guidance. Soon I had the answer. As it turns out, if a merchant fails to deliver the promised goods or services, even if it goes out of business, the credit card company has its own ways to protect its customers. And if the merchant doesn’t have the money to repay the debt, then there are still a variety of paths that the bank can follow to get your money returned to you. But back to the case at hand. Reaching out to Discover, I explained Kuss’ ongoing problem. For some time now, our consumer advocacy organization has been receiving complaints about “Uncommon Journeys” and its sister company, “French America Line.” This company has been collecting thousands of dollars from would-be travelers and then canceling and postponing their trips indefinitely. In fact, the company has not operated any type of journey in over a year. The Federal Trade Commission has advised us that the consumers who used their credit cards to pay for their nonexistent trips are eligible for the protection of the Fair Credit Billing Act and can request a chargeback from their credit card company. We have been advising these consumers to initiate chargebacks for the charges coming from Uncommon Journeys and French America Line. All of these travelers have been successful — except your customer. Lastly, I included the many links to articles about these two interconnected tour operators taking customers’ money and operating no trips. Kuss soon received the good news that Discover would reopen her case and take a closer look. And one month later — nearly two years after she made that initial deposit, Discover permanently reversed the charge. Kuss was thrilled that her nightmare was over. But since she is only one of many consumers who continue to contact us about Uncommon Journeys and French America Line, I decided to try to contact Kyte again. He had been responding to our team in the past, but then suddenly stopped after the Cathy Elliott case. I was curious about the company’s claim to have helped hurricane victims in Puerto Rico with that riverboat. By now, I had proof that the riverboat had not gone anywhere after Hurricane Irma. So I sent Kyte another inquiry. Did a riverboat really sail across the high seas to help hurricane victims? And consumers contacting our helpline had a bit more sympathy about the cancellation of their trips by this tour operator. After all, how can you complain about your missed vacation under these circumstances? However, none of this was true. This relief-effort tale seems to have been just another ploy to delay the refund payment to the companies’ many customers. A riverboat is not designed to navigate the rough ocean waters of the Caribbean. And the boaters I know told me that attempting to take a riverboat like the Louisiane out into the open seas could quickly end in disaster. In early 2018, my colleague Michelle Bell and I discussed our suspicions that the Louisiane was not in Puerto Rico helping anyone. So Michelle made her way to the Gretna Ferry Terminal outside of New Orleans where she had previously seen the Louisiane docked. And there was the riverboat — in the same place it had been for over a year. 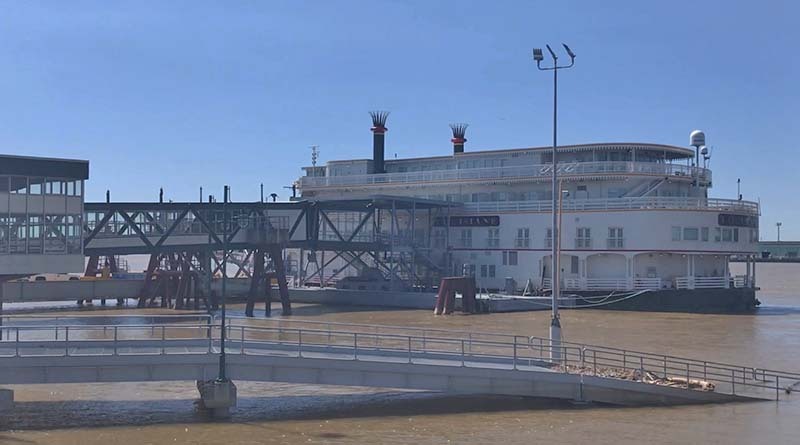 She sent me a video and a photo of the Louisiane in New Orleans — at the same time that French America Line was still telling its customers that their trips were being canceled because of the relief effort. If accuracy is important, (Ruth Kuss’) calls were taken while I was in Canada by our controller who had, as he clearly told her, left an immense package of paperwork on this on my desk awaiting my return. Again, if accuracy is important “Uncommon Journeys’ did not “commandeer’ anything, let alone a cruise ship. The most I have commandeered lately was an errant Uber driving in downtown Chicago last week. I tried again to get some explanation from Kyte as to this false claim that still appears on his website today. I believe Mrs. Kuss’ reference to the boat being commandeered was that your website “French America Line” did have an announcement about sending the Louisiane to Puerto Rico to assist in the hurricane relief effort. (that information is still visible on your site). I understand that the Louisiane never left the dock in N.O., but that posted announcement is where the confusion began for many of your customers. Kyte stopped responding again. He never explained why the company is still implying on its website that it provided help to hurricane victims in Puerto Rico. Always pay with a credit card. This can’t be stressed enough. It’s imperative to pay for any big-ticket items with a credit card; including tour packages, airline tickets and vacation rentals. Should problems develop, you want to have the protection of the FCBA on your side. It is true that you may need to pester your credit card company to provide you with the help it’s required to give. But as long as you arm yourself with information about your rights under the FCBA, with persistence you can eventually prevail. If you pay by check, cash or debit card, the tools for your battle will be severely limited. Check out the online reviews for any prospective tour operator. The negative reviews for Uncommon Journeys and French America Line date back to 2016. And media articles about duped travelers began appearing around the same time. If Kuss had done a quick internet search, she might have chosen a different company to use. It’s critical to do your research before booking with any company with which you’re unfamiliar. Use established companies that friends or family recommend. Our advocacy team receives many complaints from consumers who have tried to save a few bucks by using obscure online booking agents. In fact, it seems as if every day a new, previously unheard of, company appears — and with it a new complaint. If you stick with established brands that are recommended by friends and family, you’ll significantly decrease your chances of a tour operator taking your money and leaving you empty-handed.